Fairfield resident Paul Ferrante has been gaining attention for his popular T.J. Jackson Mysteries series (published by Fire and Ice, the Young Adult imprint of Melange Books), stories that deftly blend history and the paranormal to produce fast-paced plots with realistic characters. So far, T.J., his buddy Bortnicker and his adopted cousin Lou Anne have pursued their ghost hunting careers in such varied places as Gettysburg, PA (Last Ghost at Gettysburg), Bermuda (Spirits of the Pirate House) and Cooperstown, NY (Robertos’s Return), and Ferrante has been asked to speak at such venues as Gettysburg’s 150th Anniversary Commemoration and the National Baseball Hall of Fame. But Book #4 in the series promises to be especially intriguing, because it is set in T.J.’s home town of Fairfield. 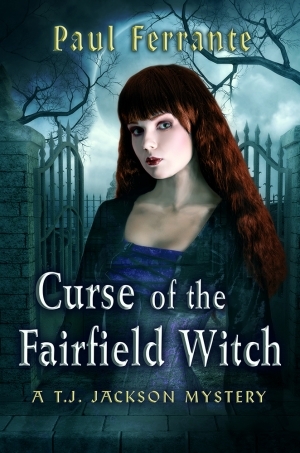 In Curse of the Fairfield Witch, a ghost from the 1600s returns to exact revenge upon our town for her perceived unjust accusal and execution for witchcraft. The trio of teens, who have become minor celebrities for their “Junior Gonzo Ghost Chasers” cable TV series, are summoned by Fairfield authorities to deal with this vengeful spirit before she carries out her curse. Within the plot, T.J. and his comrades travel to many sites – both historic and recreational – around town, and a number of area establishments are visited. The book is brimming with local flavor, which the author claims was one of his goals in writing the story. “I want to show just how much Fairfield has to offer,” he says. Indeed, it was not until he delved into Fairfield’s rich history that Ferrante decided to switch his setting from the more obvious Salem, MA to Fairfield, whose witch trials predated Salem’s by some 40 years. As a longtime educator (Coleytown Middle School in Westport) Ferrante feels that students enjoy discovering the past through mediums other than textbooks. The catchphrase of the series is “Learn the History to Solve the Mystery,” and readers young and old will be treated to a wealth of local lore. It is Ferrante’s hope that the area school systems will consider the series for inclusion in their curriculum; his ultimate goal is to bring these books to the screen. There will be an author talk and book signing reception at Avellino’s Restaurant at 1813 Post Road in Fairfield on Sunday, June 28 from 2PM-4PM to launch the book, and copies of all four volumes in the series will be available for purchase. Curse of the Fairfield Witch will also be available on both Amazon.com and Barnes & Noble.com in both hard cover and electronic formats.